Feeling the pressure of an impending ban on horse-drawn carriages, NYC carriage drivers are leafleting in opposition of a ban. The problem is that their flyers are misleading - and that's deliberate. As a requirement of a ban, an Environmental Assessment Study is currently being conducted before the carriage ban bill (Intro. 573) could reach the City Council for a vote. In desperation, carriage drivers took to Upper West Side streets recently leafleting constituents in the districts of Council Members Mark Levine and Helen Rosenthal, both supporters of this bill. The carriage drivers were telling people on the streets that electric touring cars were going to replace the horse-drawn carriages and be allowed in Central Park ― even during the week, taking over the roads. The problem here is that it is not true. Tight, ill-fitting tack. Photo by the Coalition to Ban Horse-Drawn Carriages. Also troublesome: Carriage drivers are misrepresenting the number of drivers in the carriage trade, as the city's own records confirm and as reported previously by the Coalition to Ban Horse-Drawn Carriages, which has examined official records obtained directly from the city. The carriage trade also misrepresents the number of drivers who belong to the Teamster union local, as well as the nature of this relationship. This union local primarily collects a lobbying fee. The carriage drivers are duping the public and getting away with it because no one is calling them on this deceitful misrepresentation. In a court of law, this would be perjury. It is a cold and calculated strategy to deceive tourists and local residents, New York City politicians, and news media. Many of the local news media are on their side and support this desperate misinformation campaign, by manipulating and withholding the truth. "Intro 573, the carriage ban bill, says nothing about electric touring cars," said Mary Culpepper, Vice President of the Coalition to Ban Horse-Drawn Carriages, an all-volunteer not-for-profit organization formed in 2006. "The Mayor and his administration know full well that the cars are much too expensive and would not be allowed in Central Park. Section 20-384.1 of the carriage ban bill discusses job retraining programs and green taxi medallions ― but not 'electric touring cars.' 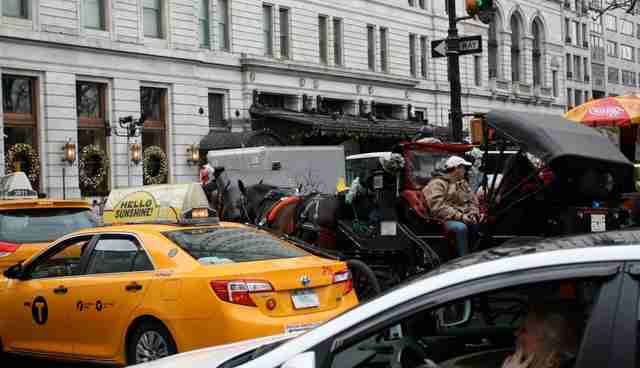 And the carriage drivers know full well that these cars are not in the bill." The city maintains records of licenses and is the authority on the number of carriage drivers. Hyperbole should not enter into the discussion, the Coalition maintains. There are 263 licensed drivers in the carriage trade, according to the Department of Consumer Affairs, as of March 24, and several of them are not actively working in New York City. Among this number are several living in other countries and working in other states. They hold on to the inexpensive license to build up their numbers. As for all the drivers being Teamsters, not so ― according to an official and authoritative source, Teamster boss Demos Demopoulos, who gave the figure of roughly 120 members to Sarina Trangle in a recent City & State article. In fact, this is less than half the number of licensed drivers. What it means is that this is not a union shop, and thus it does not provide any benefits to workers (ie, medical, vacation, sick days). Many of the workers are misclassified as consultants rather than as employees, and as such are not able to qualify for sick days under the new city law. This impacts government taxes and should be investigated. Photo by the Coalition to Ban Horse-Drawn Carriages. "The carriage driver's leaflet, which they handed out at the 72nd Street and 116th Street subway stations during rush hour, includes a cartoon depicting Levine and Rosenthal gleefully speeding through the park, as carriage horses, cyclists, and pedestrians dive for cover," West wrote. 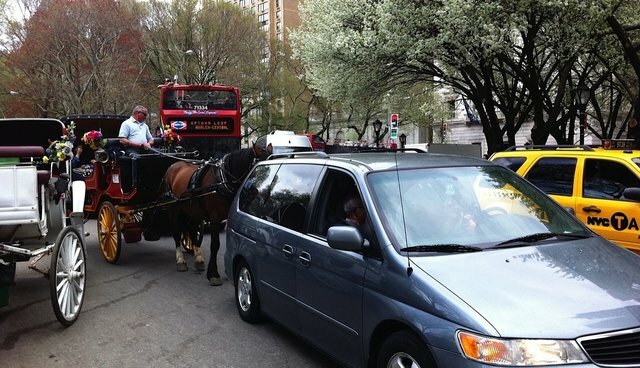 "Just what we need, more cars in Central Park," said carriage driver Adrian Marrs. Council Members Levine and Rosenthal have been telling Upper West Siders that they want to reduce the number of dangerous cars in Central Park. Their constituents have a right to know the whole truth." So why are the carriage drivers and the unions continuously trying to deceive the public? It is because they have been successful in getting some Council Members and the press to believe them with no questions asked. They are on a roll and they are getting careless. 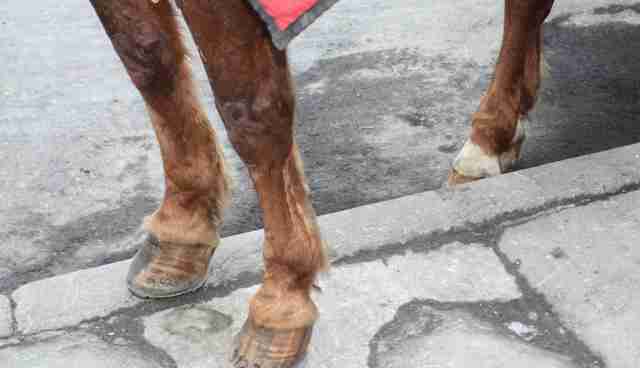 Farrier (hoof care) needed. 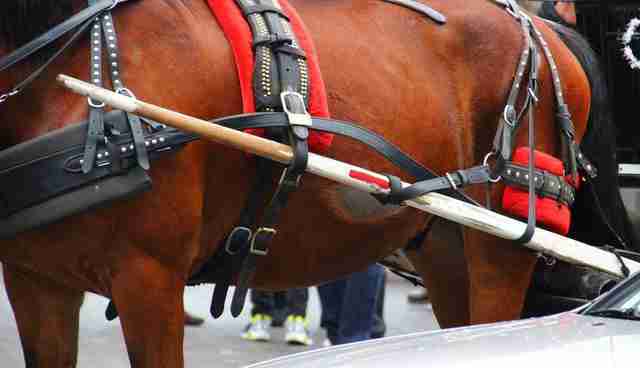 Photo by Coalition to Ban Horse-Drawn Carriages. "Hansen and Marrs, like all of Central Park's carriage drivers, are members of Teamsters Local 553. The union has put up a vigorous fight against the attempt to ban the industry, staging rallies at City Hall and building an impressive coalition of labor unions, animal advocates, and editorial boards. Three hundred families are employed in the industry, driving carriages and caring for horses. " Big harness rub. 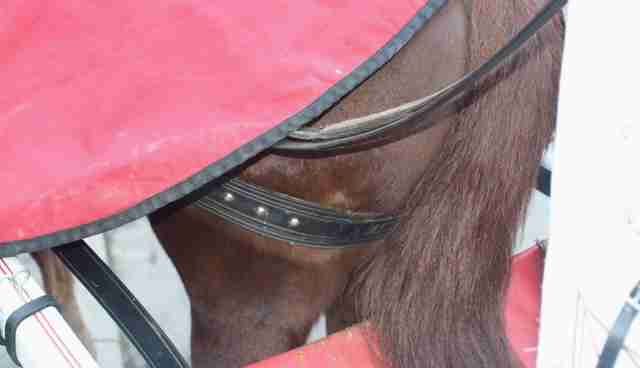 Photo by Coalition to Ban Horse-Drawn Carriage. The Coalition invites fact-finding and critical thinking on the part of anyone considering the issue. The facts are there for anyone to see if they care to do some research. Although the carriage trade seeks to confuse the issue, time will tell as to whether people will be savvy enough to discern the truth or foolish enough to fail to exercise critical thinking and question what they say. It is ironic that Marrs referred to Upper West Side voters' right to know the truth. It is the inherent danger and risk of serious accidents that the public has a right to know about. Conditions in New York City could never be modified in a way that would make it safe or humane to operate carriages here. Will the truth win out? It remains to be seen. In the meantime, the horses continue to suffer daily ― working their nine-hour, sevem-day shifts between the shafts of their carriages, loaded down with heavy equipment, wearing blinders ―coming back to an upper-floor stall in a multi-storied fire-trap stable. These stalls, while they may adhere to code, are still half the size of what experts recommend, and these stables do not offer turnout to pasture for horses to graze and relax. Why? Because carriage horses are simply considered "product" or "merchandise." They are tools. Holly Cheever, DVM, who serves on the leadership Council of the Humane Society Veterinary Medical Association and who advises the Coalition to Ban Horse-Drawn Carriages says, "The question is not whether their lives are survivable but rather whether they are humane." See more of Dr. Cheever's comments on a recent blog "Carriage Horses Continue Working Because of Faulty Science Report." Is this the best that the City of New York is willing to do for these horses? If so, shame on the City Council Members and the Administration ― both past and present ― because these sub-par conditions have gone on for far too long with our elected officials looking the other way. Many people in New York City and elsewhere have had to recreate themselves after their jobs became obsolete. The City Council has conveniently looked the other way when local stores have been priced out of their rentals and people lost their jobs. Those same people pulled themselves up by their own bootstraps. 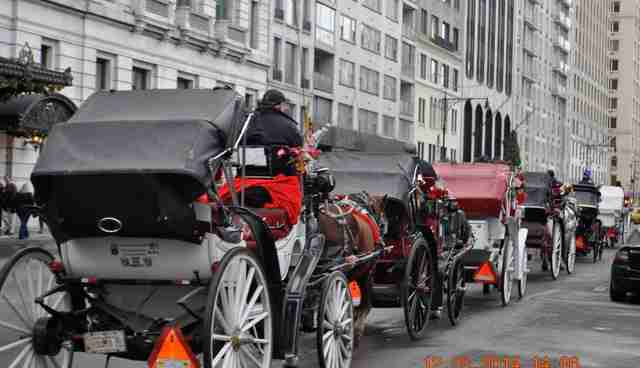 They were not infantilized and provided with entitlements as the carriage drivers have been for decades. We say "enough!" of this questionable politically motivated favoritism. it is not becoming any Council Member to continue to take this stance ― especially when cities like Salt Lake City and, more recently, Old San Juan in Puerto Rico have banned horse-drawn carriages. Enough is enough! Or, as they said in Puerto Rico, no mas!